Just a few of the many pictures on the camera. Spotting a lone sheep on this footbridge made me smile and wondering if the farmer knew his sheep were on walkabout. The footbridge connects two fields so the great escape failed. Seeing the congestion I guess they climbed the stairs but none fancied the descent on the other side. George and Carol on Nb Rock `n` Roll stopped by for tea ,cake and a chat. Toilets were the main topic with George and Carol planning changes they showed great interest in our composting toilet. Eleven days our new loo has ben in use and we think it`s fantastic. Having found more wood we found a quiet spot to split it all. Back in February we filled the roof box with wood that needed to dry out. This latest find was Willow and needed to be dryed so it was a case of swopping the box contents for the fresh cut wood. This fresh wood will remain in the box until this time next year. This post is common along the canal system and for those that are unaware I will explain. The mooring bollard tells us this is a recognised mooring place. Above the Green arrow pointing to the right it states 14 days without charge. Ignore the reference to charge our licence includes mooring on 99% of the canal system. So to the right we can stay moored for 14 days. Lower down the post it states that mooring to the left is 48 hours maximum. The 48 section is because it is a popular area near a flight of locks, a large pub and a nice village that many might, and in fact do, visit. So the message is moor away from the attraction and you can stay longer, fair enough. Now the question I have is the picture was taken out of the side window about mid way along Nb Valerie. So can one half of the boat stay 48hrs and the other 14 days? Perhaps after 48hrs I could turn the boat around and move the over staying part into the 14 day! After 96 hours I would have run out of options. We moved after the 48hrs but i wonder how the trust would view it all. When I was little I loved Charlie Brown cartoons--and I still do! 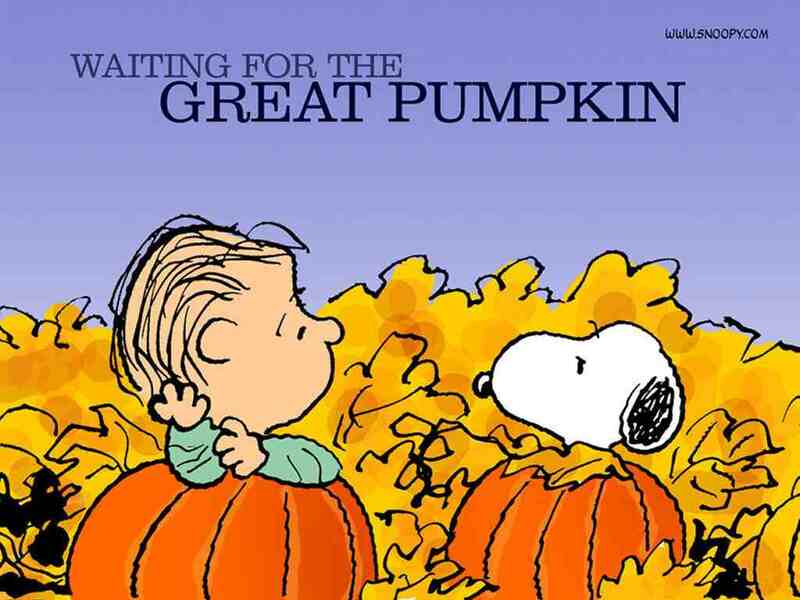 I fell in love with Linus' unwavering belief in the annual appearance of the Great Pumpkin; as I grew older I appreciated the subtle poke at all the other holidays which have children and adults alike believing in things which do not line up with cold, hard facts, common sense, the scientific method, or adult perceptions of the unvarnished world. One thing is for sure, no what you believe, pumpkins make great eating. While I will eat pumpkin pie, my favorite use for the large orange squash is Pumpkin bread and I like it year 'round. It is a favorite served for tea. Now I include this disclaimer on behalf of Dear Sir who chides me for calling this a bread recipe. After tasting it he said, "I don't know why you call it bread--this is cake!" In the States we delineate between long rising breads--be they savory or sweet--which require yeast and time to make the rise, and quick breads--those which rise quickly due to the inclusion of baking powder, baking soda (bicarbonate of soda) and high oven temperatures. Pumpkin bread falls into the latter category. In the States Libby's canned pumpkin is carried year 'round. I was therefore saddened to find no canned pumpkin on the grocer's shelves here in England where it is an import--and believe me I looked in every Tesco's, Sainsbury's, Morrisons and Aldi's I came across on our journeys. After lamenting on FaceBook about the lack of canned pumpkin, a dear friend posted to tell me she had seen it at Waitrose. Of course! The only store Les has forbidden me to shop in, is the one that carries it! Three weekends ago we hired a car and drove down south to visit family in Watford and Luton. I told Les I wasn't coming back to the boat without stopping at a Waitrose for Libby's canned pumpkin, so we found one and trooped in to ask if they carried it. The clerk wasn't sure. She took us down the canned fruit aisle and there was none. I told her in the States it was stocked in the vegetable aisle. "Oh! Of course," she smiled and led the way. They had twelve cans and I cleaned them out. A can for every month in the year!! Now several folks contacted me to say I could buy fresh pumpkins at any grocers, but I only like fresh pumpkins for their seeds, which are delicious scooped out of the innards, cleaned under cold water and then left to soak in cold, well salted water for 24 hours after which I drain them, dry them with paper towels, oil them liberally with a good oil, spread the seeds on a baking tray and bake at 350 degrees (gas mark 4) until they are lightly browned and toasty. MMMmmmm!! Otherwise I have no use for the flesh. 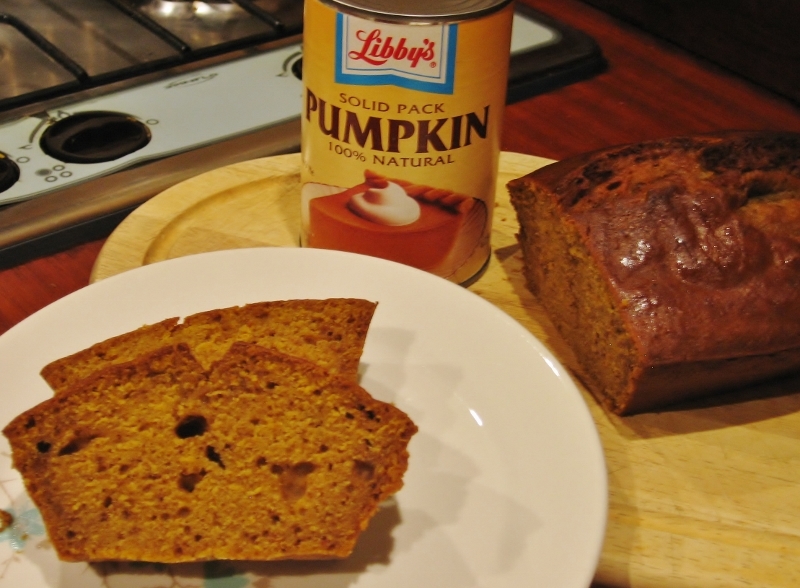 Years of experience have taught me that Libby's canned pumpkin puree makes the best pumpkin pies and breads. Why this is I do not know. Baking Soda/Bi-carbonate of Soda--2 tsp. Preheat oven to 350 degrees (Gas mark 4). Butter 2 large loaf pans. In a large bowl, mix together the canned pumpkin, eggs, oil, water and sugar until well blended. In a separate bowl, flour, baking soda, salt, and spices. Pour into the buttered loaf pans. Bake approximately 50 minutes. Loaves are done when a toothpick inserted in the middle comes out clean. Slices of pumpkin bread are delicious served warm with butter. You can also dress up your loaves by drizzling them with icing. Just mix some powdered sugar/icing sugar with some Maple syrup until you get the consistency which will run slowly off the end of a spoon. Drizzle your cooled loaves of pumpkin bread and serve. If you like nuts, you can also add 1/2 cup of chopped walnuts, hazel nuts or pecans to this bread. I have been having a look at the site of the proposed 550 berth marina at Onley. It is to be built along the Oxford canal near to the Rye hill and Onley prisons seen in the top half of the picture below. I suppose boaters will have differing opinions about another marina being built 2 miles from the 120 berth Barby marina that has yet to be fully occupied. Again just 2 miles further on Blue Haven marine under the name of Hillmorton Wharf Marina (bridge 73) have applied for a 125 berth extension. Boaters seeking a mooring in this area might have the opinion that the more berths available the better the price. Those already moored in the area might view the extra berths as leading to congestion when they cruise. © 2012 original picture, J marine. A big protester to this development is Tim Coghlan of Braunston marina and at one stage legal action was threatened so I hereby duly acknowledge the copyright of the above image and wish to clearly state I am not part of any protest group and am merely using the image for my readers information. Also the picture below is my own taken from a public footpath. I wonder if the footpath will still be along the left towards bridge 81 and beyond or will they want to re-route it away from the marina. In fact looking at maps there are footpaths across the site. It will be interesting to see what happens because they surely can`t just do away with a public right of way. This panoramic picture was taken from the top end of the development. 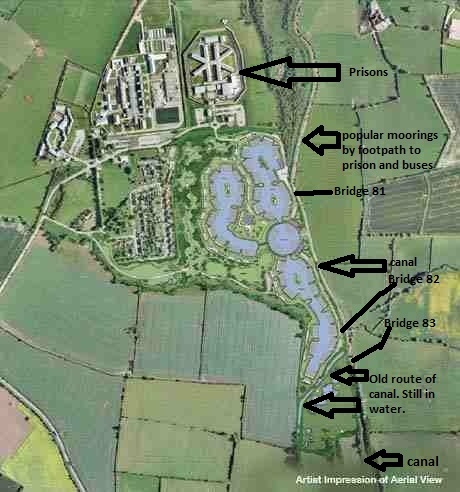 The Oxford canal is to the left just behind the hedgerow and the prisons are to the right, the marina will stretch out of sight to the right and as far as you can see on the left hand side of the picture. In a short time the view here will be moored boats. In the November issue of Towpath Talk on page100 there is an interesting letter from Paul Lillie M.D. of Pillings Lock Marina Ltd.
Other reading on the web was Canals and River Trust state a 37% increase since 2007 of boats registering as Continuous Cruisers(no permanent mooring). As Jaq and I are under this category it means we are now one of 4,400. They (CaRT) also state a total of 35,000 boats registered on their canals and rivers. The latest survey by CaRT of 3588 boaters states 31% of continuous cruises want a home mooring! I wonder how many C/c`s actually took part in the survey. Ok just checked 12% of 3588 is 430 which means 133 C/c`s are looking for a home mooring. Now if they moor at Onley that leaves 417 berths to be filled. Perhaps I can earn some money here. Of course the most successful way to fill the berths is to give away these. Recently we cruised into Braunston with the intention of going down the South Oxford canal for a week before we leave for the U.S. After spending a night in the Braunston area we decided just because we could that we would re-trace our route and return to Rugby to get some bits and bobs from the DIY store. Now while there we popped into Tesco for a few supplies as we will be having our friends Andy and Tina on board for a meal. On entering we had free pots of Yogurt thrust into our hands and as the giveaway was repeated on our exit we now have 4 pots in the fridge. Wandering around the bakery isle we were asked by a camera crew if we would answer a few questions on camera as part of a promotion by Tesco and Warburtons. The film was just for in house use so our exact words were recorded rather than a survey form being filled in. The inducement for 5mins of our time was £5($7.50) in cash not as I expected a Tesco store voucher. So off to find an out in the country mooring we passed through Hillmorton. This is Colin at Hillmorton locks. He is a CaRT volunteer giving up Thursday each week to operate the top lock. 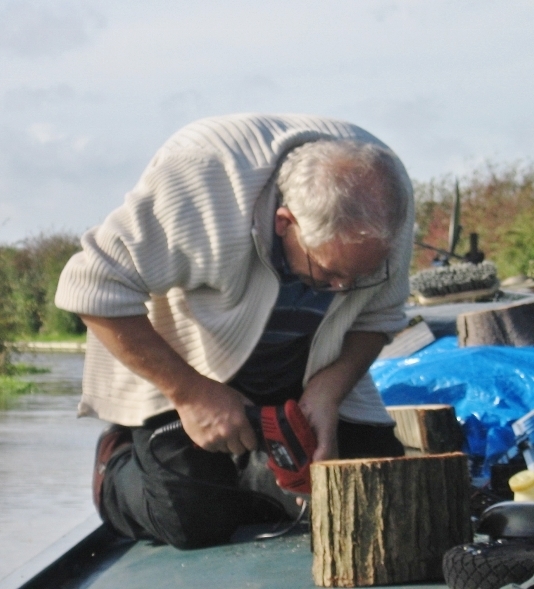 Today there was another volunteer at the bottom lock who contributes 2 days per week. Colin says CaRT pay his travelling expenses to and from home up to 20 miles. As Colin rightly says these locks are very busy during the season and if they can show hirer's how to operate a lock it will benefit us all. scene at 4pm with just Nb Valerie all alone. Now at 7pm we are sharing the peace and quiet with two other boats. Bert the Gnome aka Ross waiting for you to e mail re a meet. Fellow bloggers around every corner lately. Always nice to cross paths even if the crew are sometimes off the boat. Woke the other morning to the sound of dogs barking and a horn sounding. Jaq said it was a hunt and she was spot on. Before I grabbed the camera 2 Scarlet coated riders who we believe were the Master of the hunt and the Master of the hounds had ridden across the field followed by the hounds. As Fox hunting is now illegal I assume the hounds were following a scent trail laid down before the hunt began. This is the Canal shop where we purchased the compost toilet. originally it was at Whilton marina but is now at Hillmorton Wharf by bridge 73. It is built over one of two wet docks and has diesel and a large chandlery sales area plus the same friendly staff. Jaq got the price wrong, it was £799 ($1200) but I think this compares well with perhaps a pump out or the vacu flush prices. Best of all nothing to fail except perhaps the very small fan. An evening sky like this is just one of the reasons this is such a good life. If you are not a boater living this life remember you get one life so whatever you choose to do with your life please don`t leave it to long. After seven years the Vacu-Flush cassette toilet system on the boat gave up the ghost. I cannot say I miss it. It was a good enough system when Les was living aboard alone however adding a female user seemed to strain its tender capacity. When it charged up it was incredibly noisy--so we never ran it after bedtime, requiring a flush first thing every morning. The cassettes weighed in at about 45 pounds when full and they were of such an awkward size and shape that I couldn't lift them. Changing the cassette required Les to get on his knees, open the door under our bed, reach in and release the clip which held the cassette in place. I always thought it was an awkward placement. Every six months Les had to use a special file that came with the Vacu-Flush system and clean around the toilet trap so it would shut properly and seal tightly. We also knew when the system under the bed needed a clean because a whiffy smell rose up to the person sleeping near the edge--me! The Vacu-Flush also used a LOT of our precious water for flushing. It works like an airplane toilet, sucking bowl contents into the cassette and macerating everything into a liquid. I have the most sensitive sense of smell and the weakest stomach in the world. The cassettes had to be emptied at a British Waterways (now renamed CaRT) Elsan disposal station. I cannot be within fifty feet of an Elsan or a boat pumping out its loo tank. The stench makes me drop to my knees retching in what feels like a vain attempt on the part of my stomach to throw up an internal organ. This means Les always had toilet detail which didn't bother him and he was more than willing to do it. It did however bother me. I am a firm believer in being an equal partner in all the S****y jobs in life. Men get stuck with them more often than not. As an Alaskan girl born and raised, I am more than passing familiar with outhouses. We had one. 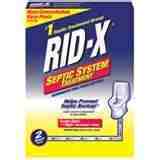 Swept out frequently, limed generously after each use with a dose of Rid-X beneficial bacteria to help the deposits compost down, an outhouse is not a bad way of dealing with human waste. Up north it is COLD in winter and there are bears to contend with in summer...still it beats squatting in the bushes. On long weekend family road trips (there are no other kind in Alaska where one can drive for hundreds of miles and see nothing but Spruce and moose) eventually one of us kids would need to wee. After pulling the car over to the side of the road, mom instructed us to squat and go. My older sister used to complain that passing cars might see her. Mom replied, "Turn your A** to the road. No one should recognize you from that angle; if they do you are in serious trouble." I always waded into the brush along the roadside and contended with mosquito bites on my exposed flesh. 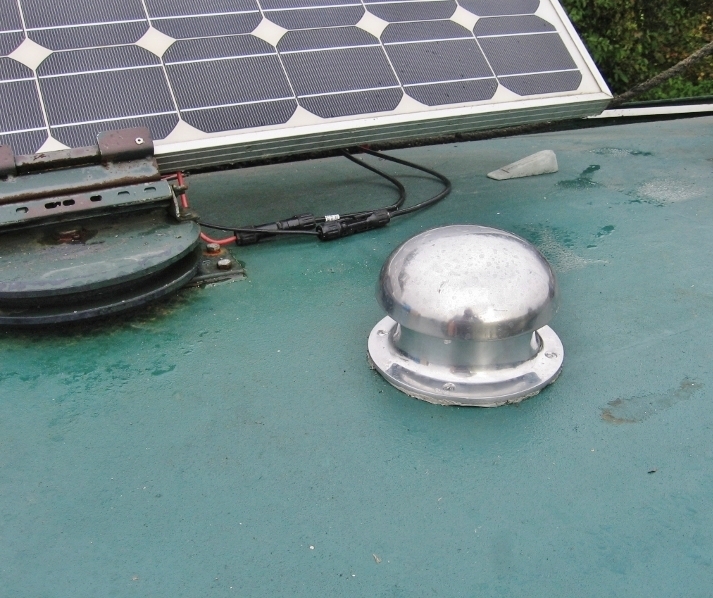 My goal before I fell in love with narrow boats was to buy a parcel of land in the back of beyond upon which to live, build a straw bale, earth sheltered dwelling and live totally off the grid: solar and wind power with a composting toilet. When I fell in love with narrow boats I wondered if a composting toilet was even a possibility. 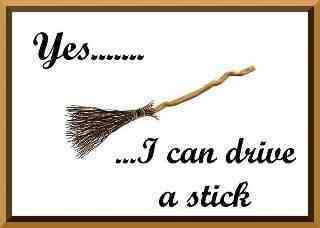 My search found NB Shoehorn. Built by Simpson Boats, it was the 2006 Crick boat show winner. The original owner specified a composting loo and a Canadian Envirolet composting toilet was installed to mixed reception. You can read the boat test about it in the link above. A further search turned up Boatwif--the blog of Ken and Sue Deveson on NB Cleddau. They had a composting loo on their boat so I emailed and our friendship began. We finally met up aboard our respective boats on the Peak Forest Canal a few months ago and I had a chance to see their Airhead Marine composting toilet in situ. Ken and Sue assured us it not only worked brilliantly but there was indeed, no odor. Several weeks back while queued up for diesel at Trent Marine Industries just before Boot Bridge on the Coventry canal, we came alongside another boat. I spotted the turbine wind fan venting on the boat roof, typical of Envirolet toilets, and had a good chinwag with the gent on the stern. He and his wife wanted a composting loo as they believed in the concept and the technology. He did say they still used a Porta Potti for urine since the Envirolet doesn't separate it out and they had problems with it being too wet to compost. Even still they preferred the composting toilet to either a pump out or a cassette. Our conversation was a revelation for me. It made me aware of the issues with which one has to be concerned when choosing a system for installation aboard a boat. 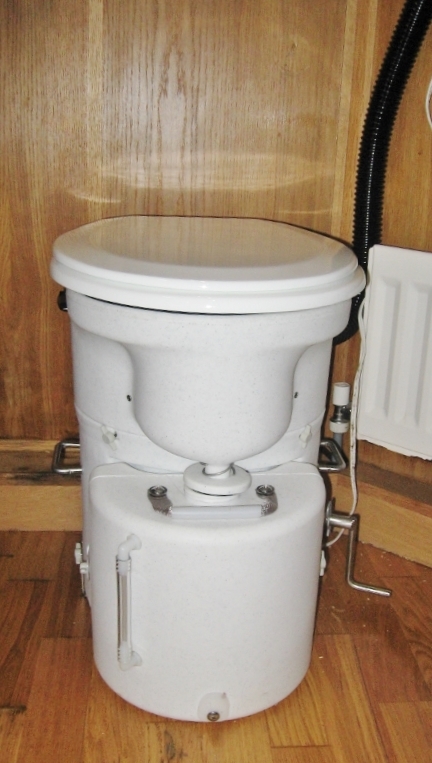 I found the Airhead composting Toilet website and spent a great deal of time comparing it with the Canadian Envirolet which was designed for cabins and off grid housing. 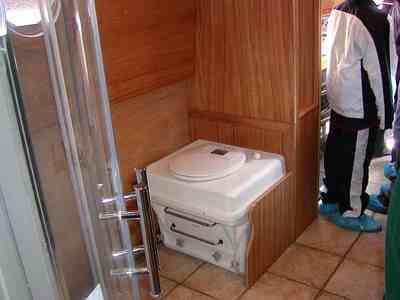 Airhead loos are marine toilets designed specifically for boats. Thousands are installed on U.S. sailboats with great success. Key to its operation is the fact the Airhead separates urine from solids which facilitates quick composting of the latter and easy emptying of the former. After viewing the Airhead toilet online I hoped someday we could install one on NB Valerie so I could take my turn in shouldering toilet duties. 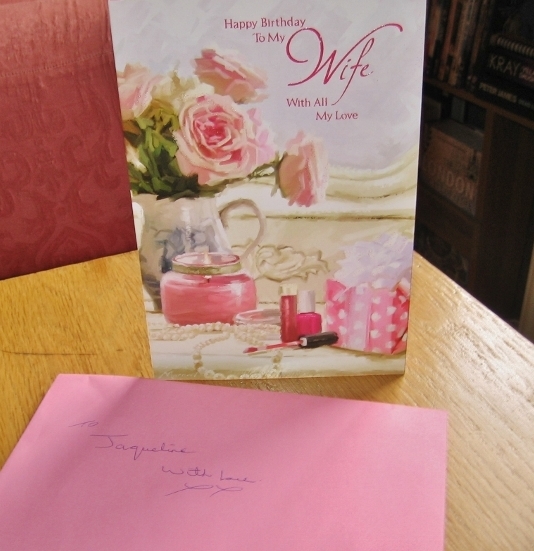 I had no idea that day was just around the corner and in time for my 55th birthday! Tuesday, October 2nd dawned cool and bright on the Ashby canal. Les and I were feeling totally chilled and relaxed, languidly lounging over our morning coffee and tea after our weekend visit with family down south. One of us used the loo and the charging system on the Vacuu-flush refused to shut off but it wasn't emptying the bowl into the cassette either. Three tense, smelly, and disgusting hours were spent by my beloved husband, following the convoluted piping of the toilet from the bathroom, under the sink cabinet, behind the bathtub and under the bed. After giving a good clean to every moving part he could find, we tried turning it back on again to find the same issue still existed. The loo had crapped out on us! We cleaned up the mess and set to cruise as quickly as possible to Hawksbury Junction where Les caught a bus to Coventry. Meanwhile I went online to Argos and reserved a Royal brand Porta-Potti. Seven hours after the initial problem broke our calm morning, Les had returned with the Porta-Potti and we cruised into the dusk, finding a quiet spot for the night. 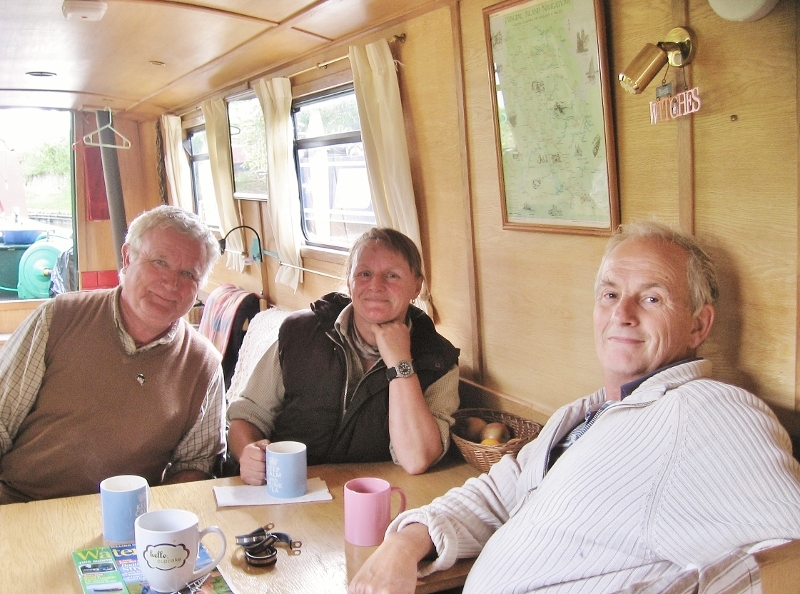 We cruised on to Brinklow where we stayed moored for four days while Les removed all traces of the old toilet system. In the interim we scoured the web for information about the Airhead system. Mainly used in the U.S. where it is manufactured, sailboat owners who installed Airhead's loved them. The system worked exactly as advertised. I emailed the company which contacted their U.K. distributor, Richard Saillet, owner of the Canal Shop at Hillmorton Wharf. We stopped in to his establishment last Monday and purchased our new loo. Richard has had an Airhead on his narrow boat for some years. He was impressed enough with how well it worked, he decided to become the U.K. distributor. Richard sold Ken and Sue Deveson their Airhead system three years ago. Before we purchased, Mr. Saillet took us through the operation and showed us how all the parts worked. 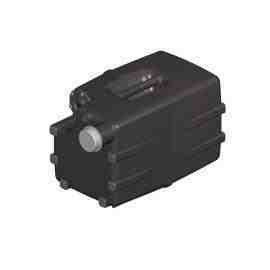 For £660.00 ($886.00) we walked out of the Canal Shop with system in hand in one box. Quite a difference in price from the Envirolet which now costs $2,479.00! After a trip to Daventry via Braunston for a Mushroom vent, plastic pipe and a round steel cutter for the drill, Les returned and spent all day yesterday putting in the new loo. 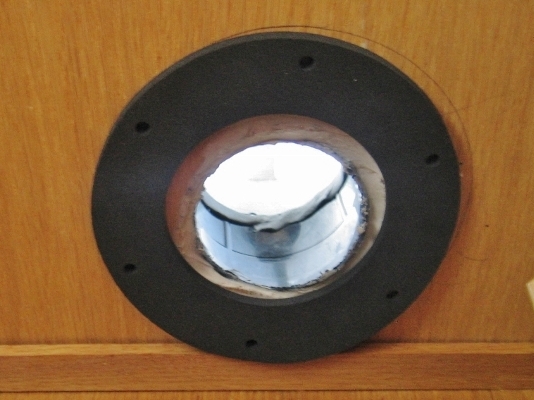 He cut the hole through the roof down through the interior ceiling, and installed a 3 inch long 2.75 inch diameter piece of plastic pipe in the vent hole, sealing it around the circumference at both ends so no air could escape. The majority of his time was spent locating wiring with which to run the vent fan and wiring it into the bathroom. The fan vent hole sealed with plastic piping, silicone, and plumbers caulking. The newly installed mushroom vent for our composting loo system. After attaching the mushroom vent to the roof so rain and debris cannot enter the vent hole, we decided where we wanted the toilet to live, marked the bolt hole placement in the floor, Les screwed in the plates and the toilet snapped into place. The remainder of the installation took very little time. The vent hose connected to the toilet and the fan dropped into the coupling, screwed to the bottom of the vent hole and Les connected the hose to it. He turned on the juice and viola! out toilet system went live! 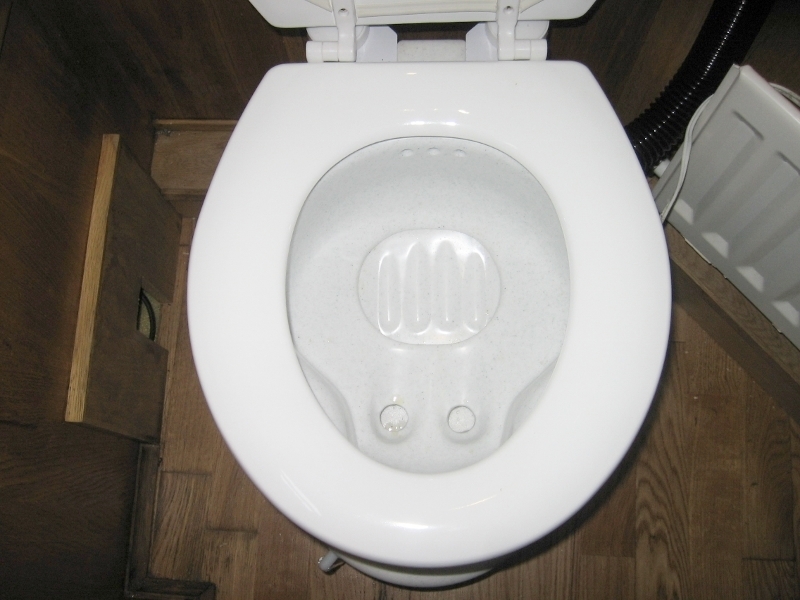 Composting toilets in the States use Coir (coconut fibers) or re-hydrated peat moss bricks as a composting medium. Coir is not available in the U.K. and Peat moss comes from endangered, non renewable, fragile environments so it is not available here either. 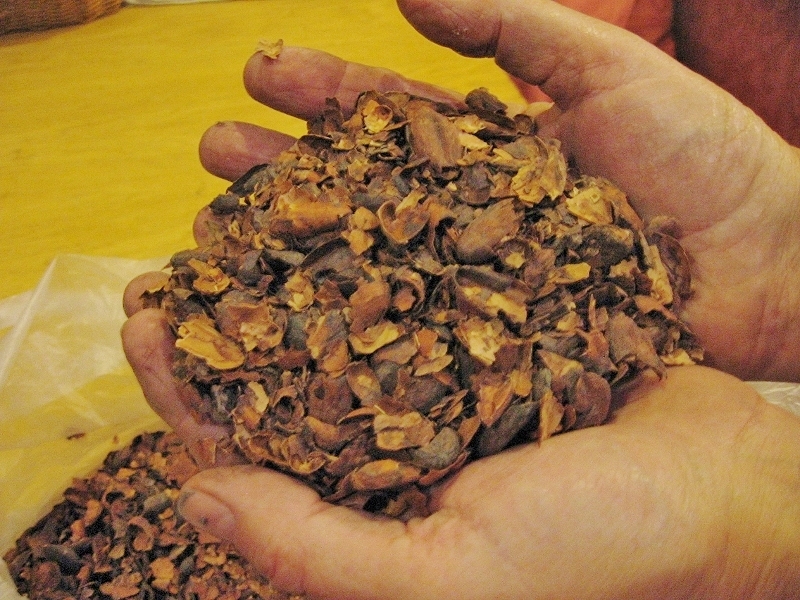 What is available in the U.K. is cocoa bean husks! Cadbury's chocolates factories import the raw cocoa beans and roast them here in England. The husks are leftover debris which is sold to a company that bags them for trade to garden centers for garden mulch. The husks are a dark, dry material that smells like chocolate! The airhead is in, we are using it, and it is working brilliantly. No odor, no mess either. I will say my initial use gave me a queer feeling indeed. The sound of urine flowing into the fluids container gave me an initial start--I thought I had wee'd on the floor at first! Leaving a solid deposit felt strange too. We are so conditioned to flush it away in water or hide it away in a holding tank. So exactly how does it work? One places a large paper coffee filter in the loo basin for a solid deposit. 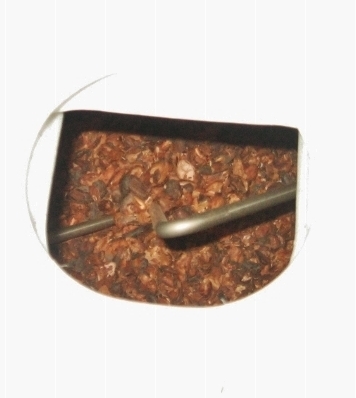 The paper filter contains your deposit which is dropped down into the holding tank with the cocoa husks. The trap door shuts and you turn the side handle which gives your deposit and the cocoa husks a good turn, stirring it together. Due to the design of the toilet tank, urine flows forward into a well designed 2 gallon fluid container with a measuring window on it so one can see when it needs to be detached easily from the main toilet and emptied. A Tablespoon of sugar keeps the urine from smelling. The 0.06 watt 12 volt fan draws air across the bowl pulling moisture out of the solids and venting it and any smells away. What makes this system turn poo into compost? The bugs in the human gut. We have two kinds of bacteria is our systems: aerobic (requiring air to flourish) and anaerobic (requiring a closed system without oxygen). Aerobic bacteria are those contained in yogurt for example. They are the good bugs which break things down and dissolve them. Anaerobic bacteria cause disease and smells, which is why they flourish when dumped into water--a low to no oxygen fluid. In a relatively dry, high oxygen environment, anaerobic bacteria die quickly. Aerobic bacteria grow and proliferate, breaking down the solid deposits in the loo with help from the cocoa husks. A sweet ending to a messy problem! 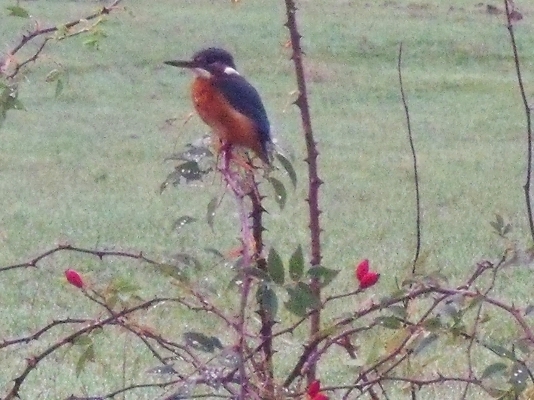 Along with phone calls, cards, emails, and posts from friends wishing me a happy birthday, Ma nature also gifted me with a Kingfisher just outside our window this morning. In magical parlance, Kingfishers bring a gift of prosperity in new undertakings, love and growth. They are a signal it is time to dive into something new out of which prosperity will grow. When we return from the States in late November we will black the boat and then I will dive into re-formatting, editing and re-writing my blog So This is Love... for publication. As we cruise along the canal I see the ragged edges of large, round Butter Burr (Petasites Japonica), browned with age. They remind me of the dirty, torn edges of lace gowns, worn one too many times to the ball. Passing through a woodland I see Nature's waistcoat glows dully with a more somber green now. Bright scarlet berries serve as buttons to shut away the winds of Autumn. Orange and yellow catch my eye, bright threads building a brocaded pattern as leaves turn against the dying sunlight. Blackberries glisten in the light, winking at me from clutches of leaves beginning a turn to brilliant red. They call me to slow the boat, reach out and gather them in, hoping I will broadcast their seeds thither and yon as birds do. I will bake them into a blackberry apple crumble redolent with spices of exotic distant lands and hotter climates--cinnamon, clove, fresh lemon zest, Moscovado sugar loaded with black treacle. As we move along our way Dear Sir keeps his sharp eyes open for wood. As Nature eventually sheds her leafy cloth and hunkers down for winter, the bones of trees killed off by storms or disease are easier to spot along the banks and in the brush. We've been fortunate to find two trees, cracked off and damaged by high winds, their broken ends protruding from amongst the bracken. Both were easily accessible to us from the towpath side--a rare occurrence as most boaters will confirm! As Les cuts the damaged limb down, pulls it out and braces it for slicing into rounds which I load on the boat roof, movement overhead catches my eye. Looking upward six swans swoop and glide overhead, amazing me with their size and grace. Turning, they bank left over a field and drop low to land on the canal--feathers ruffled, giant wings beating the air, orange webbed feet reaching for the liquid landing they seek. Settled, the swans fold their wings behind them, shake their heads and float serenely down the canal, their wake spreading a layer of downed leaves skimming across the surface of the water, summer's sad confetti announcing the party is over for one more year. Nights are chilly enough now to bank a fire of coal to warm the boat through the night. Wind gusts bend the branches of shrubbery and whisper a warning of winter-a-comin'! The last of the leaves sigh as low as grey clouds scud along above the tired fields of grain-gathered-in for another season. Nature will gather us in too, her arms large and loafy with abundance; the world is Her apron and life is a cake studded with the fruits of hard work and joy, sweetened with love and laughter, kept from spoiling by the liquor of good will and kindness, frosted with an abiding acceptance of our place in the scheme of things. It was back in October last year that British ex-pats Mike and Phillida came over from Canada to look at boats in preparation for retirement back in the UK. We communicated for a while via e-mail after Mike found the blog. We enjoyed their company for dinner aboard NB Valerie, and tea on both boats, with long, enjoyable conversations about canals and live-aboard life. Finally it was time to part ways, but not before we found a half downed tree and shared the cutting of some wood for winter warmth. Place 2 cups (475ml) of whipping cream and the 1/2 cup (120ml) of whole milk in a sauce pan. Heat on low/med. heat. Add 1/4 cup (50 grams) of sugar to the saucepan and stir until the sugar dissolves and the cream/milk begins to thicken--about 10 minutes. Put the torn croissants or brioche in a bowl. Beat egg whites and 1 Tablespoon of sugar until stiff. Set aside. Now add the yolk mixture to the cream stirring constantly and quickly. cook for an additional 3 minutes. This is your custard and it will begin to thicken. Take you custard off the heat and add in 8 ounces of white chocolate, stirring until it is all melted and blended in. Pour the custard over the croissants or brioche and incorporate. The bread should be totally moist but not too soupy. Fold in the egg whites and vanilla until all is blended. Put into a buttered deep sided baking dish (at least 12 x13). Sprinkle Almonds and 1 Tablespoon of sugar on top of bread. Bake 25-35 minutes, until browned and lightly crispy on top. The pudding will rise but should still shake a little in the middle. It is okay to err on the side of less time instead of more if you need to. Heat one cup (250 ml) of cream. When hot add 4 oz. of white chocolate and stir until melted. Remove from the heat. Stir in Godiva white chocolate liquor. Spoon sauce over each slice and serve. but none of it would be possible unless the American has her coffee fix. Off the Ashby canal we pass Charity dock moorings plenty to make the eye sparkle as long as you don`t look to much at the many sunken boats. Through Hawkesbury Junction we join the Oxford canal as the sun starts to set. Our toilet packed up completely so a trip into Coventry for a Porta Potti to stop us crossing our legs has made us late. Late for what? Nothing really just later finding a mooring than usual. We are looking at getting a marine composting loo but more on that another time. This is our mooring the morning after and looking across we could see how close we were to the trains. As we moored up in the fading light a barn Owl flew out from that tall tree on the left of the mooring picture. In the morning as we set off a Grasshopper tried to hitch a ride. He must have known we would only be going 200yards but as to why will be told next time..........dinner awaits. We have been meaning to go back to visit the family for a while now and Hinckley seemed a good location make the trip. Trinity marina is about a 20 minute walk from the town centre but when I checked the Enterprise car hire availability I discovered they had moved just a 10 minute walk from the marina. So £10($15) per night mooring fee and we were ready. The car was a Peugeot 107 or as Jaq called it a pregnant roller skate. A 3 day weekend hire was £45 ($67) inclusive of tax. Because of all hires having a £600($(900) excess if you damage the car I decided on a £33($49) insurance to reduce my liability to £100($150) if I did cause any damage. Anyway all went well and despite not having driven in the UK for over 2years I soon got back into the swing of it. Ok let them have their 5 minutes of fame on grandads blog. Starting top left Jack and Jordan.Below them are Kiernan and Kiera. Top right is Batu. On the left showing me his car is Teo and next is Lena-May. Last but not least on the right is Nikole the oldest. Well I must say we were both glad to leave the marina as being squashed between boats is to us like being imprisoned after the freedom of the countryside moorings. Still we only spent one night on the boat here so not to bad. Now back out on the towpaths again and looking forward to our U.S. trip in just a few weeks.